One of the reasons why I lusted after a BGE for so long was the vision I had of it as a BGT. Its a similar concept as a tandoor in terms of material and airflow etc, so I thought, why not? 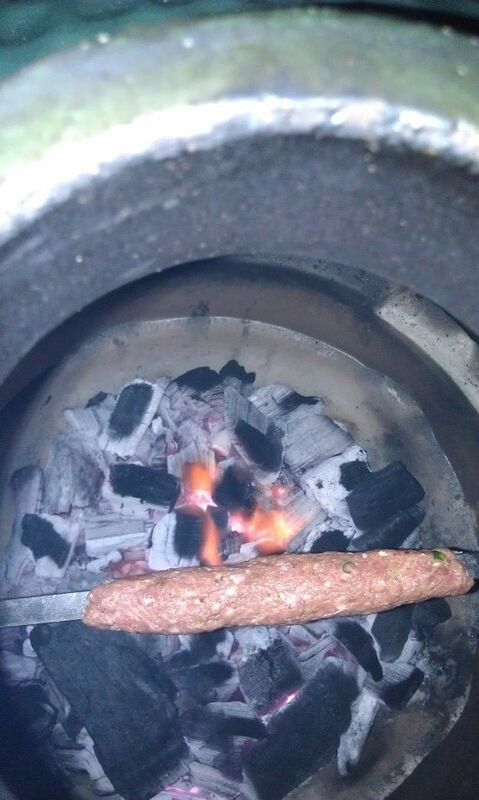 Just as brisket seems to be the nemesis of most 'cue cooks, seekh kababs are the nemesis of tandoor cooks. Its basically ground meat (generally goat, but beef also counts), seasoned with spices, molded onto metal skewers and cooked in a tandoor. The issue is that the darn things fall off the skewers and end up in the coals - not for seasoned cooks like those at Karim's in New Delhi and other less exalted joints, but for dumbar$ses like myself. The meat starts cooking, the fat starts melting and the things just jump off the skewers into the fire. You can try different binders to hold the meat together like wheat flour, gram flour (besan) and even eggs, but the proportion has to be just right or else you taste those things in the seekh kababs. I had taken a break from seekh kababs for a while, since I can do other things which much better results, but every 2 years or so, the bug bites me and i try again. And that's how we come to today's adventure. 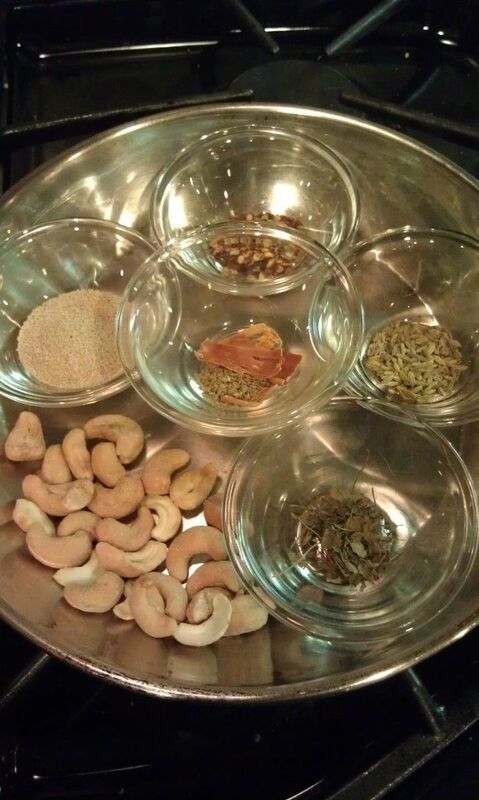 I usually use a mix from the Indian stores (Shan spices seekh kabab mix), but today i wanted to take off from scratch. So I roasted some spices in a skillet - white poppy seeds, cashews, caraway seeds, mace, carom seeds, fennel seeds, dried fenugreek leaves, and crushed red chile. 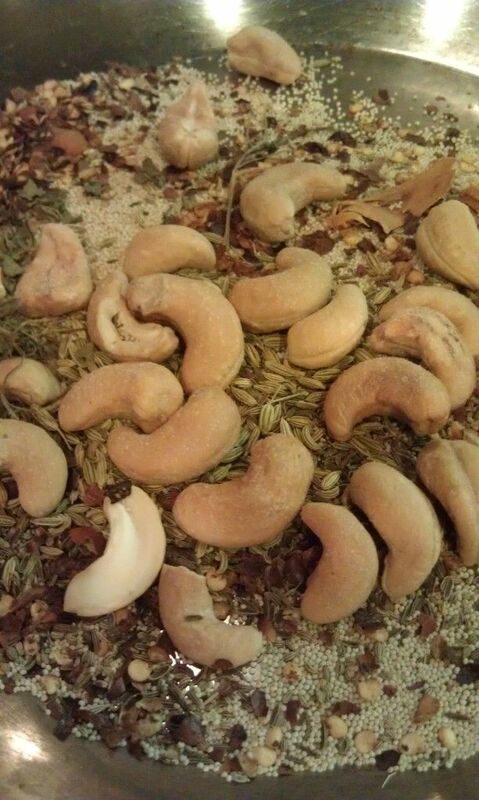 Once they were dry roasted, I let them cool then ground them in a coffee grinder which I keep dedicated for spices. 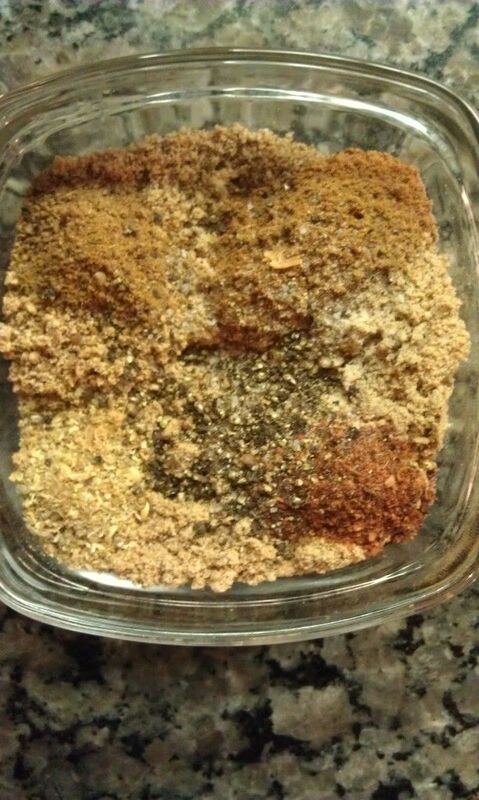 Added cardamom powder, garam masala powder, salt, pepper, chopped green chiles, ginger paste, garlic paste and ground veal. Let that all get friendly in the refrigerator, while I fired up the LBGE. 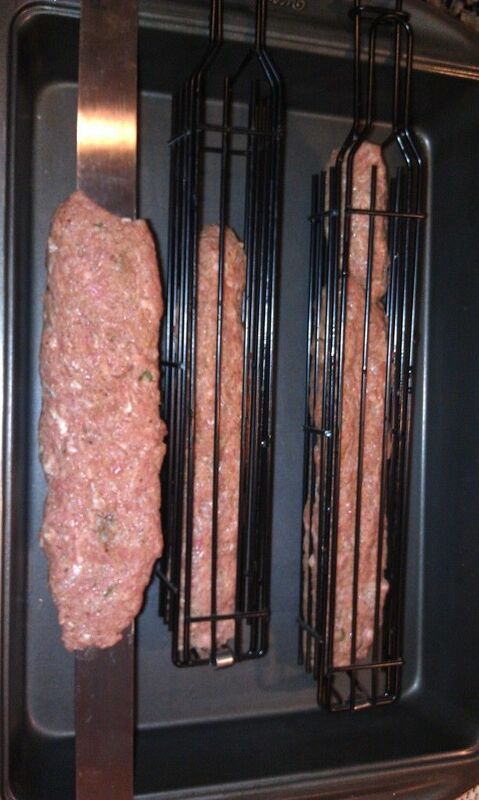 Part of the reason for today's adventure was to try making seekh kababs with a couple of different types of skewers I have - homemade ones which I fabbed myself out of 1/4" steel from HD several years ago and 1" wide Persian style skewers which i bought at a Middle Eastern store here in Houston a few years ago. Loaded up some of the meat mix on one of the homemade skewers when the egg hit about 400°F and things looked they were off to a promising start. Until a few minutes later, when I peeked in through the top vent and saw a nekkid skewer! Carp! Salvaged the kabab that had jumped off from the skewer into the coal and sampled it. Tasted farkin awesome! Flavor profile was spot on for a seekh kabab. 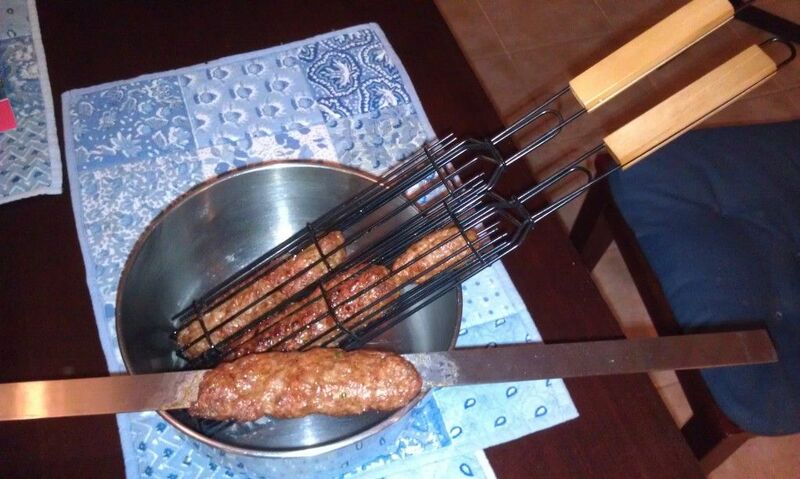 Fueled by beer and ambition, I set off to put plan B in motion- placed the cooking grate in the egg and went to mold some meat onto one of the Persian skewers and these kabab baskets i bought a while back, knowing that some day I would want to try seekh kababs again. The basket can hold a sausage shaped piece of meat, without worrying about it falling into the coals. kind of like a "McRib" mod ( I am embarrassed to say that). Set things up in a "trapeze" configuration i.e. piece of foil under the Persian skewer so that if the meat fell off it would hit the foil on the grate and all would not be lost. Rested the baskets on the grate, with the wood handles outside the egg. Turns out that I didn't need the trapeze setup. The kabab stayed put on the wider seekhs. Now I know which ones to use next time. 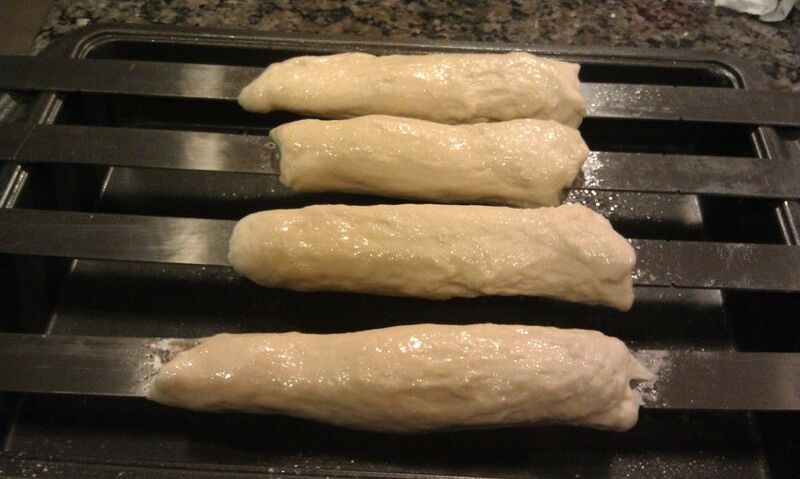 While the egg had been heating up, I made some dough for "stick naans". How could I make seekh kababs without naans? 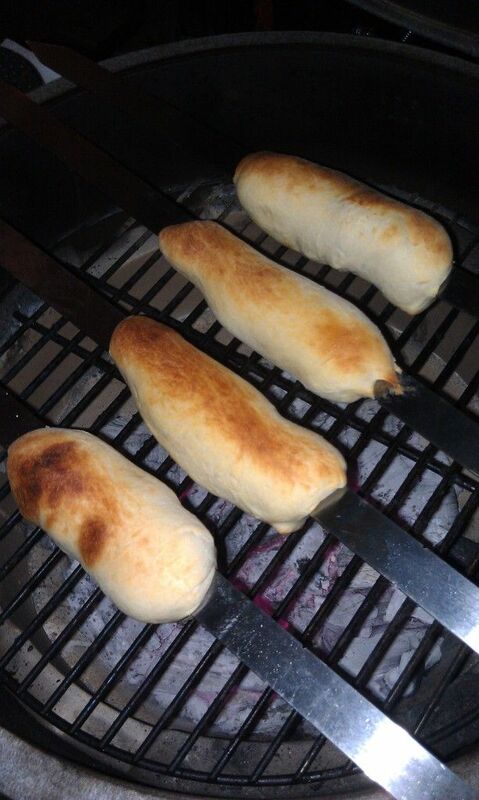 Since I couldn;t make them the usual way (sticking to the wall of tandoor) I tried Raichlens Planet Barbecue recipe for Armenian Stick Bread. The bread came out pretty darn good. Cooked 3-4 mins per side. Very nice slightly sweet yeasty flavor. Nice chewy exterior, fluffy soft interior. I will definitely make these again. A plated shot. 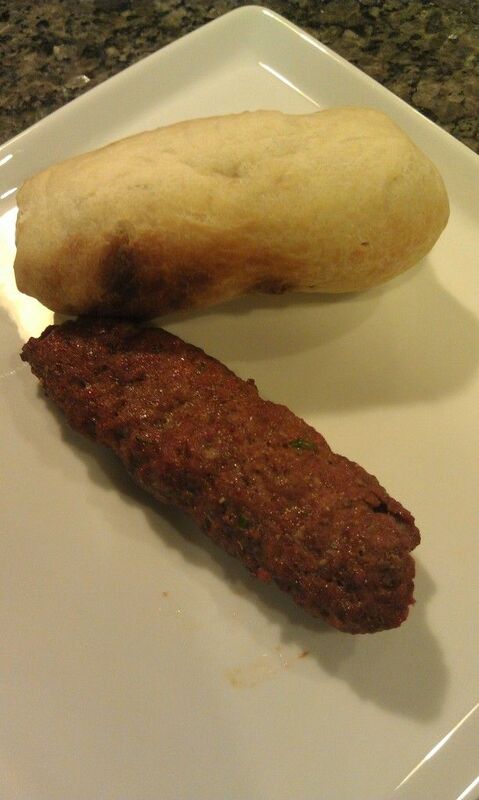 I know the seekh kabab looks like something else, but they were very tasty. Dinner was a hodge podge of things - leftover tzatziki sauce, Ethiopian food leftovers, seekh kababs, and stick naans. It all tasted fantastic though, and I think seekh kababs are back in my repertoire. Next time I will mix in some lamb though, since I think the flavor will be even better. Cool. Very neat cooking technique. 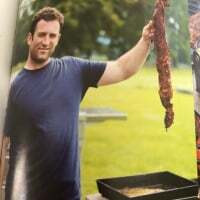 I guess the meat cooks from both the inside and outside given the size of those skewers. I've seen these at local Indo-Canadian functions but had no idea what they were, other than the "bread stick" naans. Cheers to cooking on a stick! Great looking meal. I like Turkish adana, similiar to the kabab, with chicken or lamb, but have been unable to locate any 1/2"or 3/4" flat skewers on the internet. Got some brazalian churrascaria skewers a few years back to do tandoori from a restaurant distributor but next time some friends go to Istanbul my order is in. 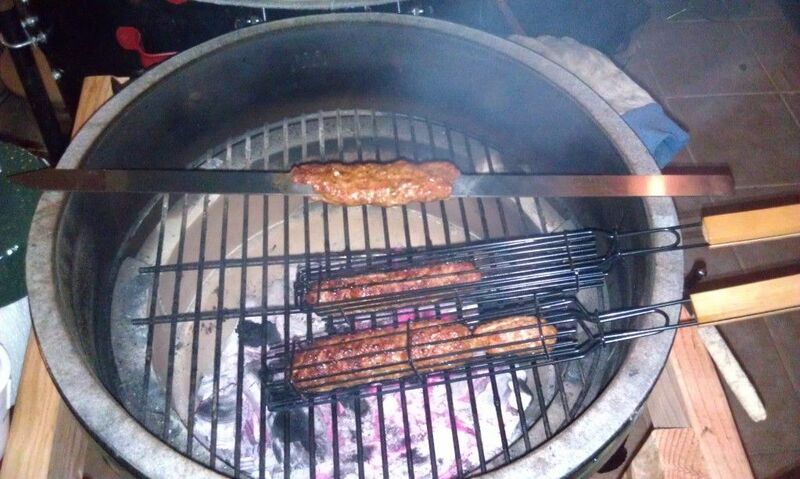 If you turn the skewers vertical use a piece of lemon/lime to hold the meat from falling. You are right - the meat cooks from inside and out. 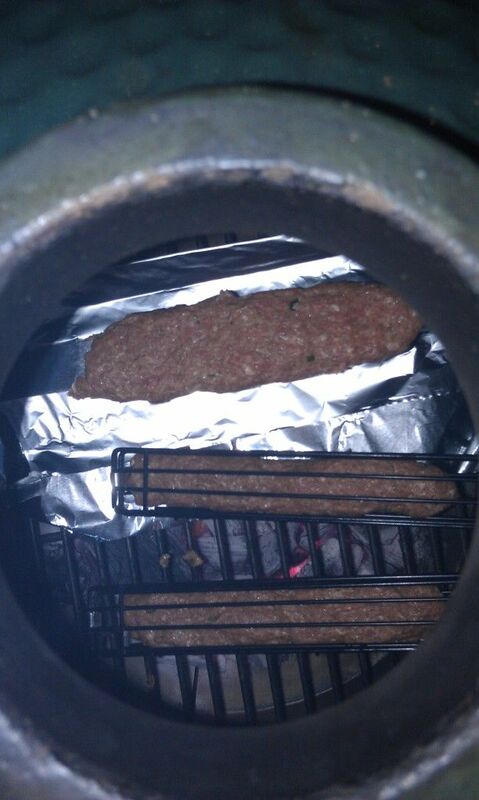 Tandoors get blazing hot - 800 to 900°F + so the the meat sears quickly. 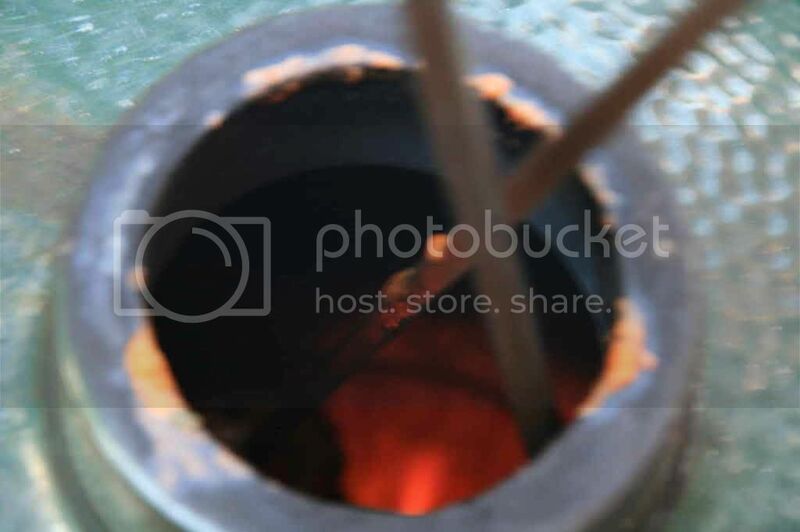 The tip of the skewer is usually in the coals so it gets quite hot to cook the meat from the inside. The skewers are the real deal about 4' long, and indestructable. I have had mine for some time now and they are great. They also have them in stainless steel now, which I may think of upgrading to. 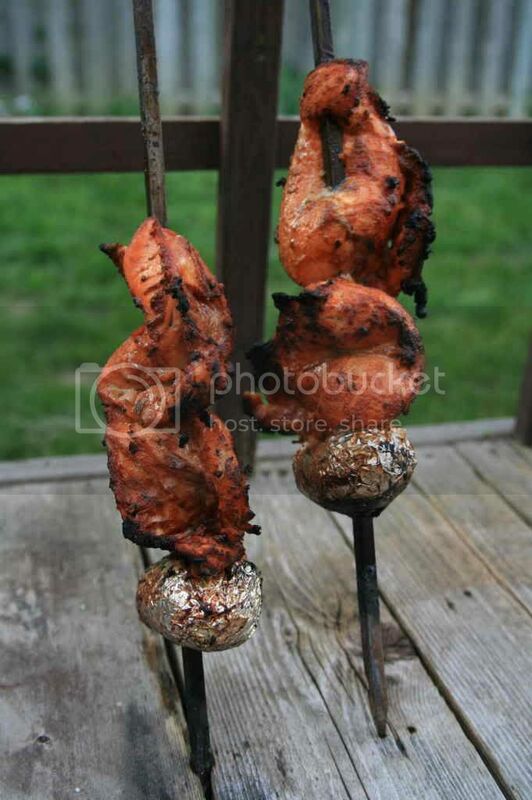 My next experiment will be to cook some tandoori chicken vertically, by sliding the meat on a skewer down through the top vent. Still working on getting my egg up to higher temps - I think I am just not patient enough. When I cook in my tandoor, I slide a potato on the end of the skewer, not so much as to hold the meat on but to act as a heat shield of sorts. The potatoes get cooked and basted with tandoori chicken juices during the cook and taste wonderful! That's cool. 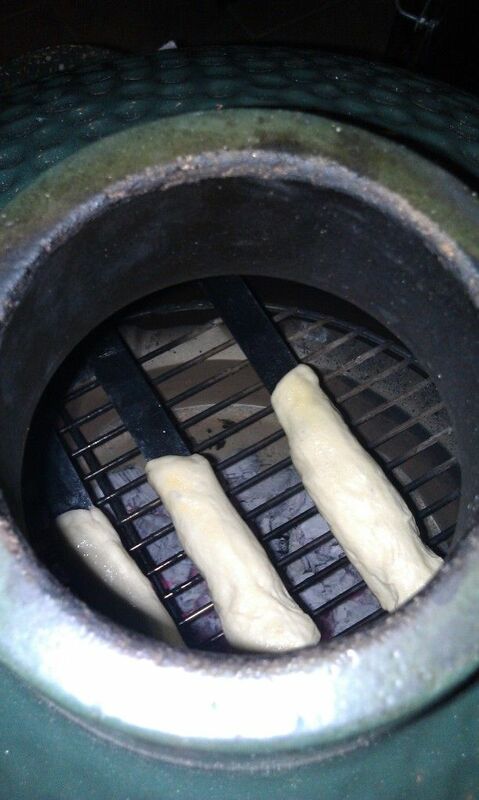 I've done naan directly on the coals and directly on the grid. Both were awesome. I'll probably try that sometime. 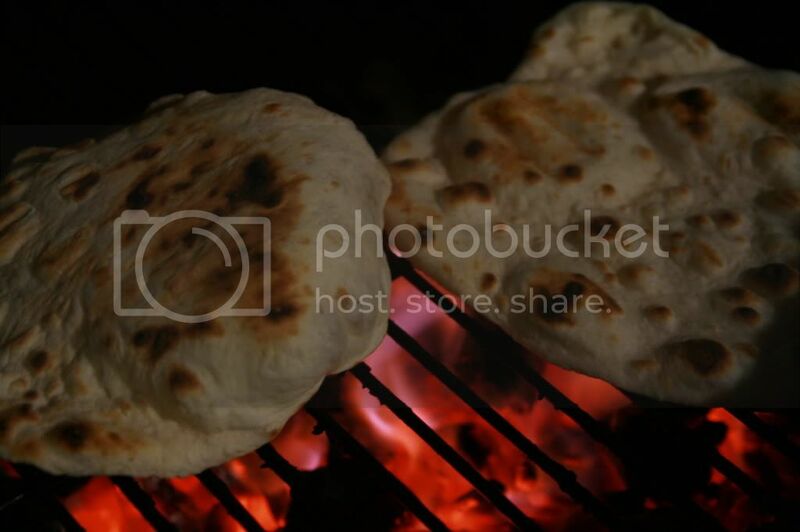 Did the naans cooked directly on the coals have a lot of ash on them? 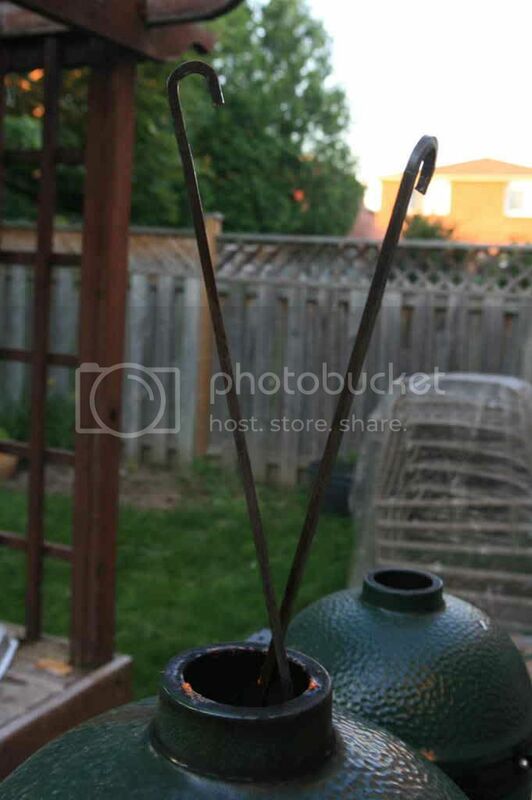 nice pictorial, would love to build an oil drum tandoor! tried different ways to do tandoori chicken ... suspending from small butcher S-hooks, inserting yard-long half inch square iron rods from Indian town through the dome, etc. lot of pizzazz but not practical for large cooks. settled on direct on the grid most of the time, including naan. Nice cook @caliking, really enjoyed reading about this one. These flavors are among my favorites. Hey, Cen-Tex, as soon as I started reading this I thought meatglue might make the perfect binding agent for these. What do you think? Finally back in the Badger State! Good to know. Will have to try cowboy style. Thanks for that tip. That is some great looking chicken! And those naans look mighty fine as well. 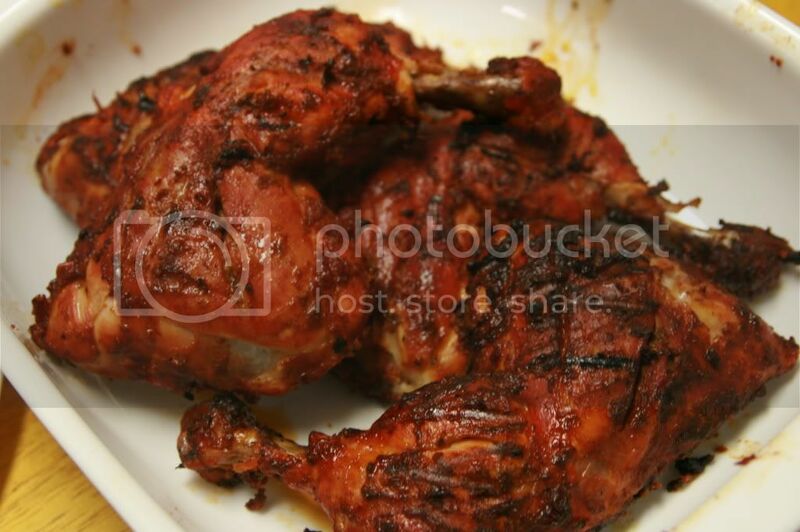 I searched the forum and found some of your past threads about your quest for tandoori cooking, and learned alot from them. Thanks for sharing. BTW, has anyone tried DP Bombay Curry? Thoughts? I have it but dont know what to do with it. I saw a cook posted here long back, someone here made a chicken with it but then went on to "dress" it with tikka masala paste out of a bottle from an Indian store. Not clear what that accomplished, but it looked good. 3) mix thickened yogurt with all other ingredients and marinade the chicken overnight. 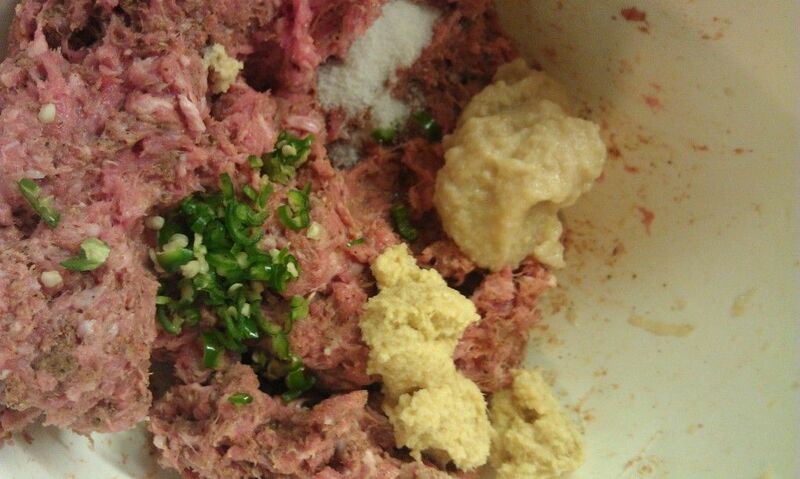 our marinade is much thicker than the one shown in video, more like semi-paste, I massage it on rather than dip. Place legs on grid face down first, to minimise marinade/juice loss at the start. You're right that the easiest way is to throw the chicken on the grid and cook the naans on the grid as well, but where's the romance in doing that? 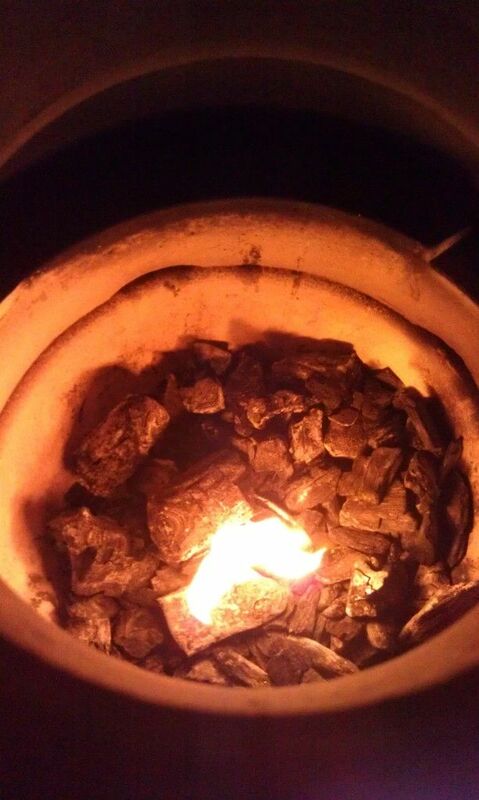 There is something primal about tending an inferno and cooking meat on metal skewers that I just love. 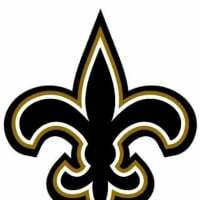 It really good for what it is. I've posted a few cooks on here with it. It's not Indian food but its a really nice way to easily incorporate those flavors into a meal. Yep, CT thats the one. That is some beautiful looking chicken! Very inspiring. If you cut the potatoes (in half or thirds if you have big spuds) and poke them so that the cut surface faces the chicken ( no foil), you end up with a potato that's basted in tandoori chicken spices and they taste great. If I'm cooking for a crowd (or in a hurry) I use Shan Masala mixes ( Chicken Tikka, Tandoori Chicken, or Chicken Broast) with 2tbsp yogurt, 1 tbsp each of garlic paste, ginger paste, and mayonnaise. The mayo lets the chicken sort of self-baste during cooking. I don't marinate for more than 2-4 hours these days, as I don't like the texture of the chicken if it has been marinated in yogurt for too long. I'll have to try that Kissan masala if I can find it around here. excuse me for not knowing if it would be authentic, but couldn't you use transglutaminase (meat glue) in the kababs to hold it together? I have not knowingly eaten meat glue so I don't know what it would taste or feel like, but in general I'm not keen on tinkering with my food that way. Nothing against those who use and know how to use it, I'm just a slave to tradition and somewhat of a purist (most of the time). The usual binders for seekh kababs are chickpea flour, wheat flour, or eggs, but I'm not a fan of using them either because I don't like the flavor they give to the kababs. Kind of like trying to make the perfect burger, I guess. Unless you live in a cave in the savannahs in the Serengeti, you've unknowingly eaten tons of meat glue. It's in hot dogs and lunch meats. Or check a TTG IgA. At least you can see if you have celiac disease. That stuff, uh, keeps us stuck together. So until I got married it never struck me that you can buy paneer readymade. I had seen it in stores, but for some reason the bulb never went off. I used to make paneer at home all the time, but not as much any more. It tastes so much better though when homemade. Or check a TTG IgA. At least you can see if you have celiac disease. That stuff, uh, keeps us stuck together. Ha!. You're on a roll today ( I did catch the other one in the bourbon thread) However, if you check only a tTG IgA you won't catch all celiacs.